- The lab tech gives a short set of text boxes about how he hasn't seen Oak, could the player go looking for him. 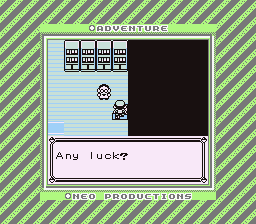 - It then sets a flag which switches the dialog to a simple "Any luck?" OaksLabScript_ConcernedAide_1: ;Load text for "PLAYER!" ld a, $0a ;Load Text for "I haven't seen Oak..."
Script 0 looks for the EVENT_SENT_TO_LOOK flag when you warp in to trigger the event. That works perfectly. The initial text triggers perfectly, but does not appear in a text box. The script does not even load the new text after the player exclamation, but does set the flag for the EVENT_SENT_TO_LOOK, which is at the end of that scripting segment. The player sprite and NPC sprite DO get set properly amidst the script where they are supposed to. Looking for any thoughts, tips, pointers, ideas on scripting structure. I emulated the structure as best it made sense to me from other scripts, separated the movement from the text more, loops to check if the character was in movement, etc. Sorting some of the scripting out and getting the bug fixed/elements working according to plan. One issue bugging me now is that the Aide sprite that should appear near the steps instead still appears in the upper left hand corner and then pops into place after the first script has run. Any thoughts? This reminds me a little of the issues that came up when I was trying to help Fotomac put some scripted Phone Calls into the game that ran as soon as you entered the map. May or may not find anything useful looking through this thread. But yea, the only thing sucking now is that sprite. Its like the sprite isn't loaded to the map yet when the script attempts to run. OaksLabScript_ConcernedAide_1:   ;Load text for "PLAYER!" Still can't get the facing right on a regular basis. But that script executes appropriately. Ah ha; it wasn't always with other movement/text scripts, it may have been in a later script in a sequence so I missed it.